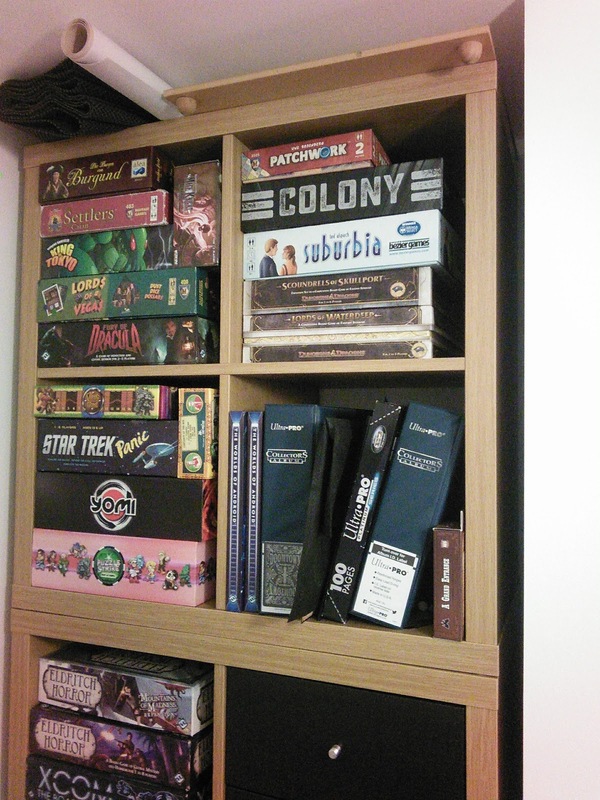 Over the Christmas period my family were very generous with board games to the point where my shelves are now creaking. I’ve written before about my belief in curating your collection such that it is active i.e. the games actually get played rather than gathering dust, but I think it is a point worth revisiting along with the current status of my collection. 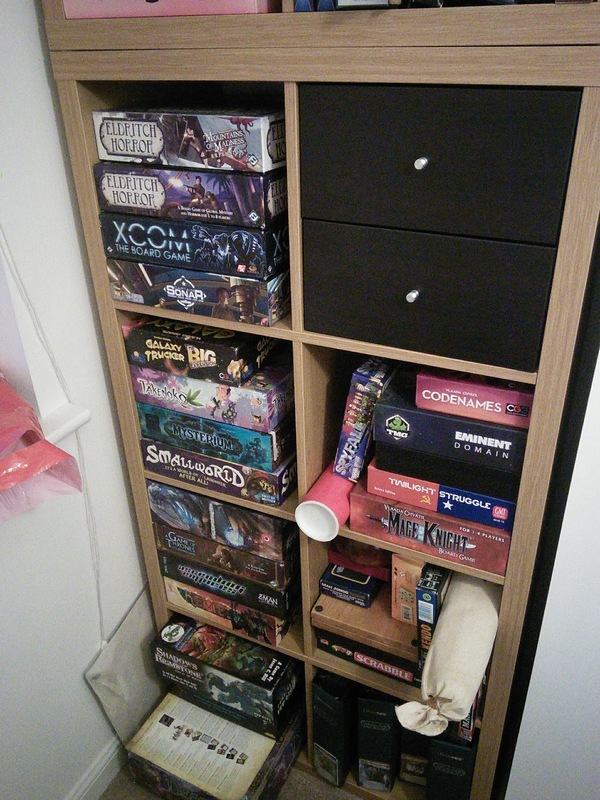 Small Games in the Drawers, all my Eldritch is in two boxes for now! Netrunner on the bottom left. Excluding expansions, games I have previously owned and items currently in my Trade/ Sale pile I own 54 unique games and honestly that is probably too many. With the new additions I definitely have some cross over i.e. Kemet and Cry Havoc are both strategy games of the man-on-maps variety and it will take some time to noodle out what will stay and what will go. Eminent Domain: A good game with a terrible name, but I think my group has gone off deckbuilders. Hasn’t seen play for a while and I am not sure really what gap it fills any more. Settlers, which I have a lot of nostalgia for, but I think Takenoko fills that spot much better and with a lot more charm. Design and presentation have moved on so much since the early days of the current boardgame boom and I just think games like Takenoko and Lords of Vegas make for a better introduction to the hobby. Smallworld, I’ve had a lot of fun with Smallworld but it just doesn’t see a lot of play and again has crossovers with Cry Havoc and Kemet. Spyfall: I do like Spyfall but Codenames seems to get to the table more when I have a lot of people to accommodate. I would hope that Captain Sonar may also fill that player number requirement as well. Twilight Struggle: Barely played my copy as I don’t really have an opponent for these deeper kind of two player experiences. I’ll either have to track someone down or give it the boot. I am more determined than ever to make sure the games in my collection are played over the course of a year and to that end I will be tracking plays as much as possible, bound to forget a few. Anything not played by the end of the year is going to get traded/sold. Although I may be missing some game types I feel the collection is pretty complete for my group. My game cafe of choice has a good selection and people with much larger collections than me, so hopefully I can get some plays in of whatever the New Hotness turns out to be this year. My real hope is that I get to know the games I own better, and in doing so focus down on what I really like about those particular designs and in doing so improve my own critique and creation.